When it comes to hardware leaks, @evleaks is no stranger. In fact, virtually all pre-release press renders show up online through his account. 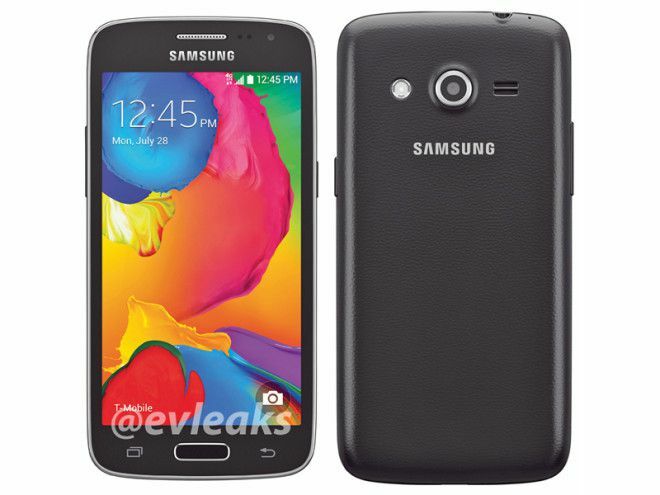 So it’s no surprise to see a T-Mo Samsung device being leaked earlier today. The device in question is the Galaxy Avant, a smartphone we know very little about. Samsung is yet to announce the device, but based on the image, we’re assuming it’s a low to mid-range device. Clearly Android-powered, with a camera, LED flash and loudspeaker on the rear. Styling is very similar to current galaxy devices, but its rear shell has an unusual texture to it, similar to what you might expect from a 1980s laminated kitchen work surface, or the plastic interior of a car. We don’t know any specifications, or when the device is set to land. But when it does, we’ll keep you posted. Covering this but not MS McLaren or 635 release date and pricing that also leaked via peepeeleaks? True. My store only offers expensive crappy Alcatel devices or outdated/problematic LGs. I think the alcatels are excellent value when evaluating their specs vs price (evolve at 69.88, fierce at 129.88) but a lot of customers are looking for reputable manufacturers, even if it means a small price increase. Until the L90 came out we really had nothing to compete with the handsets offered by boost/virgin and Straight Talk in this niche. Samsung is obviously the most highly regarded brand, so if this phone becomes a reality and is under $200 I think it will fill a huge hole in our current offering. You can call hsn to order the item number, they have a channel where they sell to misinformed people who are either too lazy to go to a store or lack common sense to research a product. You do not belong here if you have no clue what the Nokia brand is. Well made products that easily triumph Samsung any day. Yes Microsoft has a lot of catching up. Hop off, dude. You cannot possibly be sitting here saying that Nokia is better-regarded than Samsung in the public’s eye. Have you ever owned a Nokia product?? Nokia still maintains quality control and Samsung used to build nice devices but lately dropped the ball. True, true. Nokia=Indestructible. Don’t forget about the brick phones you could run over with minimal damage… to your car. Problem with Nokia is lately their phones have been lackluster with an operating system that is great once you get used to it, and has awesome potential with Microsoft at the helm. The only problem with that previous sentence (besides grammar) is the words “get used to it”. Most of us don’t wanna… yet… Samsung offers competition for the iphone, great camera, and if you are into the nuts and bolts of it, it is a well put together machine. But yeah, glass breaks pretty easy. There is always a trade-off. Ahhh I find your comment refreshing. Finally someone understands what made nokia a brand name. My favorite nokia smartphone that I miss sometimes is Nokia e71 wow did that smartphone feel solid with 3 day true battery life and solid reception that no other brand could compete with. YAY…Another Samsung Home button device. Hmmm…which is which? Blah…blah…. We need phones with good physical keyboards. Like the Sidekick ones. SaY what you want about the back cover,it still looks better than the one on the S5. The date on the screen says Mon, July 28th. Significant? If I had my guess the specs are 1.2 GHz quad core snapdragon 400, 1 gig of ram 8gb memory, microsd slot and LTE with a 4.2 inch screen. It just strikes me as the specs that Samsung would put with this phone cause this phone is likely the successor to the galaxy light. Too bad it is not a Tizen phone. I just cannot wait for one to launch. What are you– paid by Samsung to say this crap? With Samsung’s track-record in software development I would sooner rub finely-grained sand in my eyes. Besides, Tizen doesn’t bring anything unique to an already consolidated market– Android, iOS, Windows Phone, Blackberry, and Symbian. What a very odd reply! Why would my preference for something other than creepy google’s android monitoring devices indicate that I am paid by Samsung. I am happily awaiting Ubuntu Touch, Jolla (to launch in the States) or Tizen. I loved my Symbian and my N9 MeeGo, but both of those platforms are deceased. Tizen brings another open source platform, outside of google’s control; and that alone is a good thing. @cam_bunton:disqus This phone is very significant actually. It is the first phone on T-Mobile to include the 700MHz-A block for LTE. It recently passed FCC certification with the new frequency. I would link to the FCC but I don’t want to get caught in any spam filters. You can see in the report, LTE Band 12 is included in the phone and has been tested. Looks like its behind a password wall. I’ve been waiting to see when the first band 12 phone would show up, looks like we might have the answer. Hopefully the fcc filing goes public again soon. They must’ve made it private when they noticed it was getting traffic. I have a feeling they will be announcing it on the 18th as the first compatible phone.